Archaeologists report finds of sophisticated architecture, well-preserved textiles, and funerary offerings. Like many of Lima’s huacas, the Huaca Monterrey isn’t much to look at from the outside: sandy, lumpy, and generally an archaeological letdown in a country with such monumental sites such as Chan Chan and Machu Picchu. Surrounded by houses and urban activity, the Huaca Monterrey is located in the working class district of Ate, in Lima. However, archaeologists working in the area have made a number of important finds that are leading experts and local residents alike to reevaluate their ideas about the site. According to El Comercio, the Huaca Monterrey dates back to about 1300 AD, when it was constructed by members of the Ichma culture. The site reached its peak around 1470, when the Ichma had been absorbed into the Inca empire. The site is divided into two sectors (called Monterrey I and Monterrey II), and archaeologists are currently undertaking extensive excavation in Monterrey I. In addition to architectural finds, excavators have found Inca textile goods, including a shirt with feather decorations. Andina news agency reports that other finds include fine ceramics and spondylus shells, which were brought to the area from Ecuador. In more recent years, the huaca and the surrounding area have been used for a number of purposes. Much to archaeologists’ dismay, the huaca has been used variously as a dump, a fulbito court, a latrine, and a smoking den. According to El Comercio, the residents of Ate who live near the huaca are largely migrants from the mountainous rural areas of the country, who fled their provincial homes during the years of terrorism. One of the most notable aspects of this project is that excavators have worked to involve members of the local community. Local government official Claudio Villarroel told El Comercio that “We really didn’t think that the huaca could be worth anything. 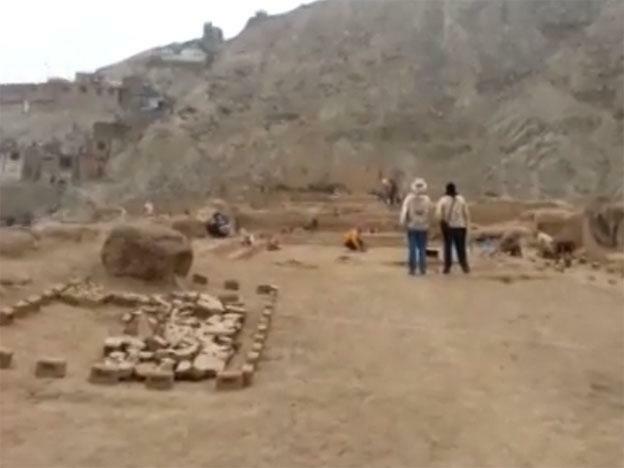 Now some of the young people that were gang members are working on the restoration.” El Comercio reports that 16 archaeologists and 30 laborers, many of whom live in the area surrounding the huaca, are working on the excavation. According to Caceres, there are 366 huacas in Lima alone, but 90% of them are in need of restoration. The Huaca Monterrey project represents an investment of S/. 1,156,610 by the Ministry of Culture. Huaca (sometimes written as “waka”) is a Quechua word that signifies a holy place but is now commonly used to refer generally to archaeological sites in Peru.